Can be used for anything at Wind Power! Can be put toward a lesson, a rental, or anything in the shop! Cannot be used for online orders. 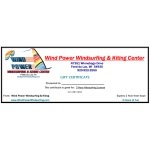 Gift Certificates are valid for one year from date of issue. During the check out process, please click on "in-store pickup" in order to avoid shipping charges and we will email the gift certificate to you.